Two EF5 tornadoes hit the Oklahoma City area in May. The first tornado hit Moore, OK and had winds estimated at over 200 mph reaching a maximum damage width of 1.3 miles. State officials confirmed 24 fatalities due to the twister. The storm injured over 300 others with preliminary damage estimates totaling over $2 billion along its 17 mile, 40 minute path. The twister destroyed two Moore elementary schools, killing seven schoolchildren at Plaza Towers elementary and injuring many others. Moore was hit in 1999 by another EF5, which had the strongest winds ever measured on earth: 302 mph. One day previous to that event, a violent twister traveled from east Norman to near McLoud causing two fatalities. That tornado was rated as an EF4. While numbers are still preliminary, the National Weather Service counted at least 19 tornadoes between the two days. Officials from the Oklahoma Department of Emergency Management estimated that the two-day barrage impacted 2937 homes, businesses and non-residential buildings. “A super tornado, as I have defined it, is F5 and 2 miles or wider,” Smith said. “Less than one tornado in 50,000 would be categorized as a super tornado. Put one of these [super tornadoes] into a major city such as Dallas, Wichita and Kansas City, and it would be a major disaster.” There would be the potential for thousands of casualties. Smith stated that a super tornado could cost tens of billions of dollars if it hit a major city. It’s expert Rick Smith’s belief that storms like this occur, on average, about once every decade. That may be a low estimate since we’ve now had three 2 mile wide tornadoes in just 6 years. Oklahoma’s school superintendent says as many as 56 public school sites were damaged by violent storms and floods that ripped through the state last month. Superintendent of Public Instruction Janet Barresi said Friday that three sites in Moore and the El Reno campus of the Canadian Valley Technology Center were destroyed. All seven sites in El Reno Public Schools reported damage from wind, water and large hail. Lincoln, Hillcrest and Rose Witcher elementary schools are temporarily closed because their roofs have been declared total losses from softball-size hail. It will cost millions to repair these schools. 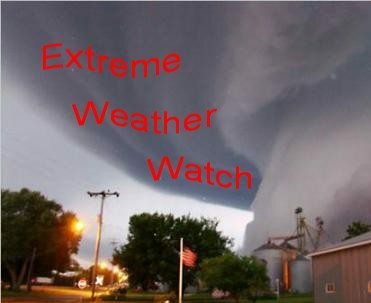 There was more extreme weather besides the tornadoes. On May 30th severe thunderstorms developed over central and eastern Oklahoma, as well as in northwest Arkansas, producing very strong winds and large hail. Several short-lived tornadoes developed, affecting areas near Oilton, Mazie, Murphy, and Broken Arrow. Major flooding became an issue as the thunderstorms tracked over the same areas, dropping several inches of rainfall. Southern Le Flore County received 3 inches to over 6 inches of rain on the 30th and the 31st, with a majority of that rain falling in the 6-hour period from 9 PM on May 30th to 3 AM on May 31st. This rain led to extreme flash flooding with reports of 4 to 5 feet of water in homes, several bridges washed out, and numerous roads and culverts with damage. Included in the 20 fatalities due to the El Reno tornado were three professional storm chasers from the Discovery Channel. There were also 115 injuries. The 11-day span between the El Reno storm and the May 20 tornado that devastated a large portion of Moore “is the shortest time span between EF5 tornadoes in Oklahoma history,” the National Weather Service said. EF5 tornadoes are a very rare occurrence in US History. Before the two EF5’s in Oklahoma in May, there had only been 60 in the United States since 1950, when reliable records began. That means the Oklahoma City area has seen two of the extremely rare EF5 tornadoes in less than a month. Farmers Insurance spokesman Mark Toohey says that the company received a total of 1,714 claims from the May 31 storm, with 75 percent of claims concentrated in property and 25 percent of claims filed for auto. State Farm spokesman Jim Camoriano reported 3,600 homeowner’s and 6,100 auto claims as of June 1 for the storms that occurred May 19-21. As of June 5, The Oklahoma Insurance Department says that claims filed by state residents have climbed to 32,433 since May 19. The filings represent insured losses of nearly $250 million, including 13,938 homeowners and 724 commercial property claims. Flash flooding brought about 11 inches of rain, complicating rescue and recovery efforts and causing dangerous conditions for motorists and those stuck in buildings like a courthouse where up to five feet of water had pooled. More than 86,000 customers in the state were left without power as the weekend of June 1 began. In Missouri, tornadoes and straight-line winds of more than 60 mph leveled homes around St. Charles and St. Louis. Homes were leveled, and a casino, a hotel, a health center, four schools, and the St. Louis Lambert airport sustained damage. About 200 roads were closed due to flash flooding in the state, and 89,000 customers lost power. Damage and dangerous weather also touched down in the form of high winds, rain and golfball-sized hail in Kansas, Arkansas, Illinois and Indiana. Hardly any of the mainstream media reports mentioned that the cause of these increasingly common billion dollar extreme weather events is global warming. It’s as if our house is burning down and we are busy adding fuel to the fire by pumping 88 million tons of carbon dioxide into the atmosphere day in and day out. There’s a smallness in our official response to what’s been happening in the center of the USA. At the federal level we send hordes of rescue workers, and tons of dollars to repair the damage, and at the local levels the people say, “We are staying,” proudly, defiantly, as if this were a boxing match in the fifth or sixth round and they’ve only been knocked down, not out. We’re playing to the network cameras, politicians and victims alike, when, as you say, John Lawrence, we haven’t recognized yet that the weather has changed. It’s way past time we did what the Dutch did when the sea grew higher and came in over their dikes; they prevented it from happening again, instead of simply returning again and again to distribute sandwiches and blankets to survivors. That’s an astute observation, Bob. Instead of the victims saying defiantly that they will rebuild, when are the news reports going to interview someone who says, “This is the result of global warming and it’s not worth rebuilding because it’s only going to happen again and next time will be worse.” The psychology of storm and tornado victims needs to change before we can establish some consensus about global warming and what needs to be done to counteract it. The local push back in the affected towns against building requirements and the addition of safe rooms to new construction and public schools doesn’t make any sense to me. Requiring trailers to be tied down with cables is an assault on….liberty? Are people truly opting for praise the lord and pass the sandwiches as their only option? This is the crux of the problem, and not coincidentally, why property values in Texas are so much cheaper than, say, here in California: There are no uniform building standards. Builders can get away with pretty much anything they want, and if a house falls apart because of it, there’s no recourse. Too bad, so sad for you, dear homeowner. But then again, I guess that’s what insurance is supposed to be for, right? And if you can’t afford insurance, you’re SOL. As if safe rooms weren’t common sense enough (if costly), even simpler safety improvements that cost a couple hundred dollars at most, like anchoring houses to their foundations with a handful of bolts around perimeter walls, were ignored when Moore was rebuilding from the last disaster. Not that stuff like this in any way eliminates the need for a safe room, but it shows what lengths the builders were willing to go to cheap out. California has the tightest building codes in the nation; our insurance rates are pooled with others – they bend we spend. Examine 1999 photos of Moore Oklahoma beside a 2013 photo you’ll see the same wood framing – the same rubble. They live there because people must live someplace. But in a place with heavy snow homes have steep roofs; in a place with tropical breezes homes have many opening windows; in a place with earthquakes sheer force is considered in construction. But in the midwest and southeast; areas frequented by hurricanes and tornadoes blow down homes are the norm. Last week a Oklahoma state legislator spoke against tighter building codes because it would add to the cost. Seat belts added cost to cars, but it wasn’t a reason not to do it. But one can not help but note that extreme weather, countless victims, and tragedy make great photo ops for the political vermin, and fund raisers. Charities have raised trillions of dollars in the past decade, and I would bet my salary that less than 1/2 of 1% of every dollar raised in the name of some cause has ACTUALLY gone to said cause. Typhoons, Hurricanes, Earthquakes, Mudslides, Sinkholes, Tornadoes, Blizzards, Drought, Haboobs, Windstorms, Hail, Dangerous Lightning, Dense Fog, Monsoons, Floods, Flash Floods, etc. All we can do is ADAPT. John: The media doesn’t mention it because that would be delving into politics, and politics shouldn’t be the story. It would be too much like taking sides in the climate change debate, which would take away from the real story, the loss of life and property. There is a time and a place to start having that discussion, and as we’re now a few weeks out from the storms themselves, I think we’re now entering that territory. But the immediate aftermath, I think we can agree, is most certainly not that time. But once we do start engaging in that discussion again, as I wrote early last week, it has to be framed as an economic argument, with compelling reasons to step away from fossil fuels (i.e. global warming causing fuels). Currently the economics are still solidly in favor of the oil and gas companies. Those tables must be turned before we can see real progress on global warming. Mr. Dorn, you castigate Oklahoma because “At the federal level we send hordes of rescue workers, and tons of dollars to repair the damage”. Do you make the same assertions regarding every city that is built along the Gulf Coast and East Coast? How many times have federal workers rescued that population from hurricanes, and how many federal dollars have been spent to rebuild their homes (they can’t buy insurance – isn’t hurricane coverage only through the Feds?)? What of those residents who defiantly refuse to heed mandatory evacuations? Mr. Lawrence, when will the global warming handwringers quit paying scientists to skew “statistics” in favor of so-called “green” practices? How many tax dollars from Oklahoma have gone to “green companies” through Obama’s “stimulus package”, which said companies are now bankrupt? Global warming is about real as the emperor’s clothes. Did global warming cause the 107 tornadoes in Oklahoma in 1957? The next year in which the number of tornadoes exceeded 100 was 1982. You tell a statistician what you want the numbers to prove, and he/she can manipulate the numbers to do it. You see in the weather what you WANT to see in the weather. It has yet to PROVE anything. Before you and Mr. Cohen try to pin tornadoes on fossil fuels, perhaps you should look at the last 100 years of historical data. Temperatures wax and wane. As do the number of tornadoes, the amount of snow, the amount of rain, and the number of hurricanes. It is highly egotistical for humans to think that anything we are doing is causing the weather to change. Yahweh God is the CREATOR of the world. He, and He alone, is in charge of the weather. There is a lot of wisdom in the 38th thru 41st chapters of the Book of Job in the Holy Bible. When you can answer all the questions contained therein, you will have the authority to explain global warming. And to the others who have looked down your noses at the construction practices/codes in Oklahoma, you would also do well to gain some education about an F5 tornado before you begin to advise on building codes. You should know that, unfortunately, brick veneer, foundation bolts, and hurricane straps won’t usually stand up to an F5 tornado. In fact, an F5 is capable of picking up a train engine and tossing it – an there’s really no construction code that will enable a building to withstand being hit by a train engine. Oh, and property values are lower in Texas because the state isn’t bankrupt, and the state legislature only convenes in odd-numbered years, and their session is limited to 140 calendar days. Perhaps if California was better at managing its money and state government, its real estate values were come down within reason also. Based on tone and references, I’m fairly sure you won’t trust any of us – but try on a different point of view from someone who lived in Nebraska and knew tornadoes. Last first, California contributes more money to the federal union than any other state. Oklahoma takes more than it gives. But that’s ok, there are giver states like California and taker states like say Texas which at last report, was the largest taker state. Building codes – California has the toughest – every earthquake they tightened up added cost be damned. Until the Northridge earthquake in 94 – a vertical thrust – 1 g force straight up – engineers could not design a building taller than 3 stories that could withstand a vertical thrust quake. They raised the white flag and accepted there are limits to what we can do. But throughout the midwest – a place as you noted frequented by tornadoes for centuries – you are as likely to find flimsy mobile homes scattered among residential housing. Buildings have been engineered to stand up to most of what happens – to protect against flying debris – it’s called pre-stressed reinforced concrete and with today’s technologies can be made to look very attractive. But humans are slow to change. From Homested Florida to Moore Oklahoma both were blown down, rebuilt in the same fashion only to be blown down again. As to the Gulf Coast, I agree. Not so much cities as the developments on the outer banks and barrier islands; all made possible by FEMA flood insurance. If the private market place declined to write policies why would the US Government do it instead? And FYI – this happened under Reagan with Republican support. Last point about FEMA and helping out. About 10 years ago we here in San Diego County had the worst fire in California’s history – the Cedar fire. A few thousand homes burned down, a couple dozen people killed, FEMA spent $57 million on helping people. Then asked for it back. Seems the FEMA law is designed to cover Hurricanes and Tornadoes, not wild fires. The vast majority of FEMA money is spent in Red states – go figure. But it would be nice, to show a few manners and note that of the FEMA and federal dollars going to help out Oklahoma, and Texas and Florida and the Gulf Coast states, the lions share of that money is coming from Californians. Rather than criticism, maybe a ‘Thank You’ would be appropriate. I guess if you want to entirely negate science and take refuge in the Bible, your point of view makes sense. I for one choose to trust the great preponderance of scientific evidence that man’s activities, namely spewing carbon dioxide into the atmosphere, is causing global warming and is capable of destroying the planet. Man is the only animal that can trip over the same stone twice.